Next up we have the Hirosaki Neputa at the Honolulu Festival Parade. This tradition comes from the Hirosaki Neputa Festival in Japan. 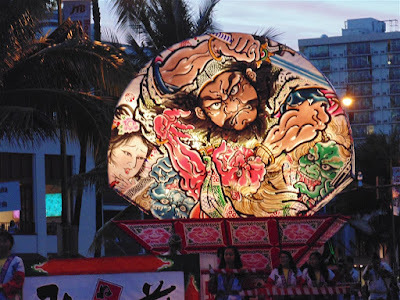 During the festival 80 neputa parade floats go down the city with Samurai paintings and other designs. Its nice to get a little taste of it with this Neputa. These are huge you can see how small the people are moving it at the bottom of the picture and they just look spectacular all lit up. I will be on short break and resume the photo of the days in April. This entry was posted on Monday, March 21st, 2016 at 12:25 am	and is filed under Feature, CityPhoto, cultural, Hawaii Photo of the Day, Attractions. You can follow any responses to this entry through the RSS 2.0 feed. You can leave a response, or trackback from your own site.